Opus reaches final for hospitality’s most prestigious award. Opus at Cornwall Street have been selected as semi-finalists for the prestigious Royal Academy of Culinary Arts Annual Awards of Excellence. The awards, which are designed to recognise the UK’s most talented young people within hospitality, will see Opus front of house staff Dorenzo Pratt and Iona Adams, as well as chef de partie Martin Baylis, the only kitchen staff in the Midlands to be named as a semi-finalist, complete a series of exams, interviews and technical tasks this month in an attempt to achieve the industry’s most reputable award. The gifted trio reached the semi-finals after demonstrating exceptional knowledge and an enthusiastic attitude through an application process. 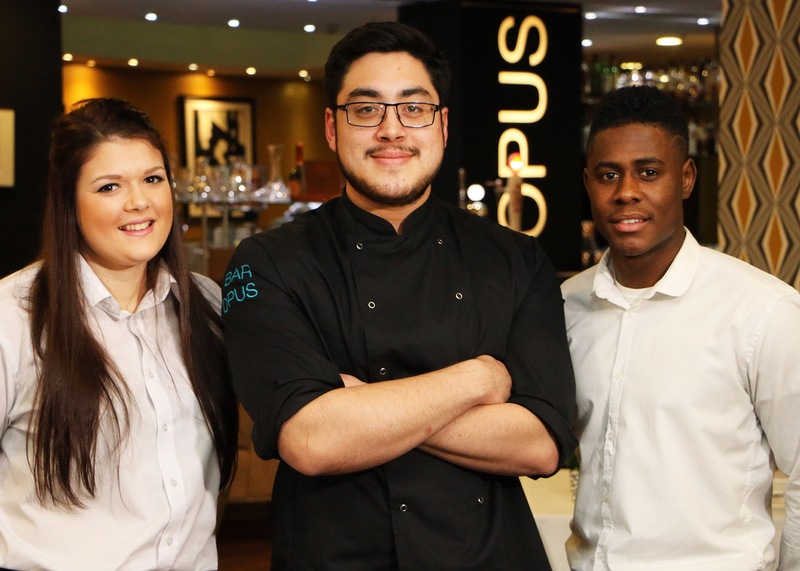 During the finals, Dorenzo, who has been working at Opus for two years after starting as a part-time student from University College Birmingham, and Iona, who has been at Opus since January 2016, will partake in a written exam and rigorous interview on Opus’ food and wine menus in order to receive the esteemed service award. Martin, who has been working for Opus for one year, will have two hours to prepare squid, salt baked whole sea bass, a rack of lamb and an apple tart, as well as complete a theory test and demonstrate basic kitchen skills to receive the kitchen award. Irene Allan, director at Opus at Cornwall Street, said: “We’re very committed to developing our front of house and kitchen teams, so having three members reach the finals for the Royal Academy of Culinary Arts Annual Awards is a tremendous achievement. We’re incredibly proud of Dorenzo, Iona and Martin and are thrilled that their talents and sector knowledge has been recognised. Not only will the award be a huge achievement for our staff personally, but it will also be an achievement for Birmingham’s growing culinary scene. The Royal Academy of Culinary Arts Annual Awards of Excellence is an examination and not a competition. All or none of those that reach the final can achieve the award depending on their ability to attain the standard of excellence set by the judges. Dorenzo and Iona took part in the service finals on Saturday 19th March at The Ritz in London. Martin will take part in the kitchen finals on Wednesday 30th March at University College Birmingham. I wish them all good luck with this prestigious award. Any visit to Purnells Restaurant in Birmingham City Centre is a real treat, when visiting with a couple of friends even more so. 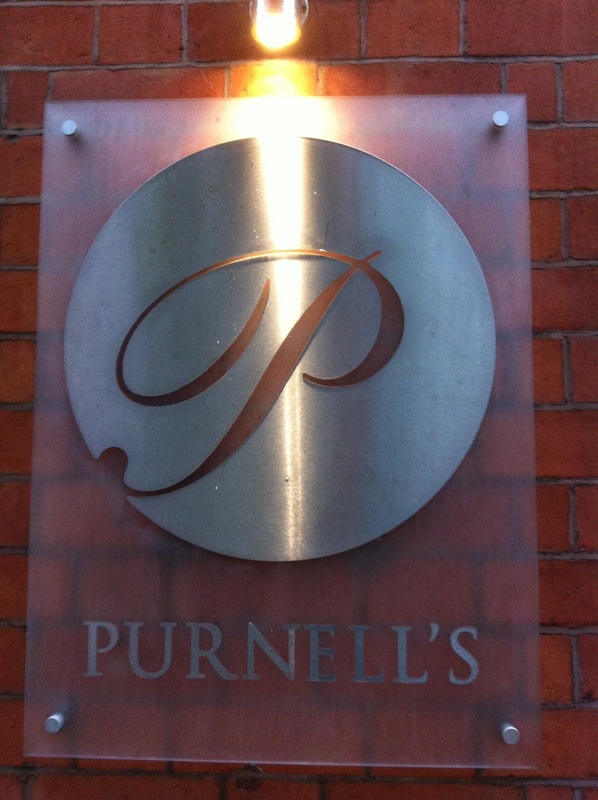 Purnells Restaurant on Cornwall Street in the Colmore Business District is one of the go to restaurants in Birmingham. Chef Glynn Purnell has stamped his food footprint on this glorious city like a bright shining Michelin star that he has above his door. Glynn Purnell has represented Birmingham well. He won The Great British Menu in 2008 and then again in 2009, one with a desert, one with fish. Since it opened in 2007 Purnells Restaurant has always been a chic place to visit, a celebratory place. Well that is how it has been to Ruth and I. We have celebtrated special birthday’s and getting engaged there. Purnells won a Michelin Star in 2009, its a contemporary space, fine dining without the stuffiness, way more modern and knowing than that. It is always best to mention your dietary needs when booking, and whether vegetarian or I’m sure vegan you will be well catered for. Purnells is a spacious restaurant, with a large bar area. This is where we began our night with a glass of champagne and some aperitifs with the menu. 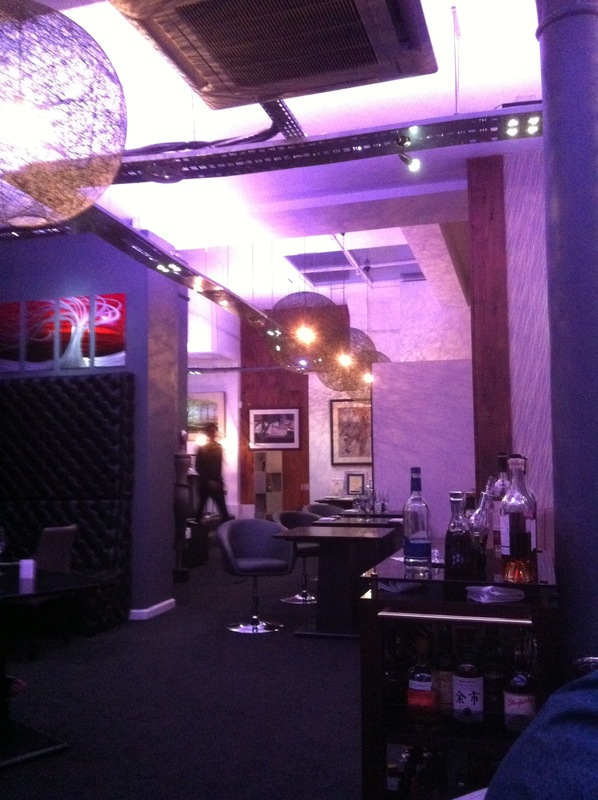 The bar area is a comfortable space, designed to help you relax and before being taken into the main event. The large dining room has seating for couples, small parties and one for a large group. The menus represent the ‘old’, and ‘new’ or ‘now’ as its called. ‘Summer, Sunshine, fun times and sand castles’. 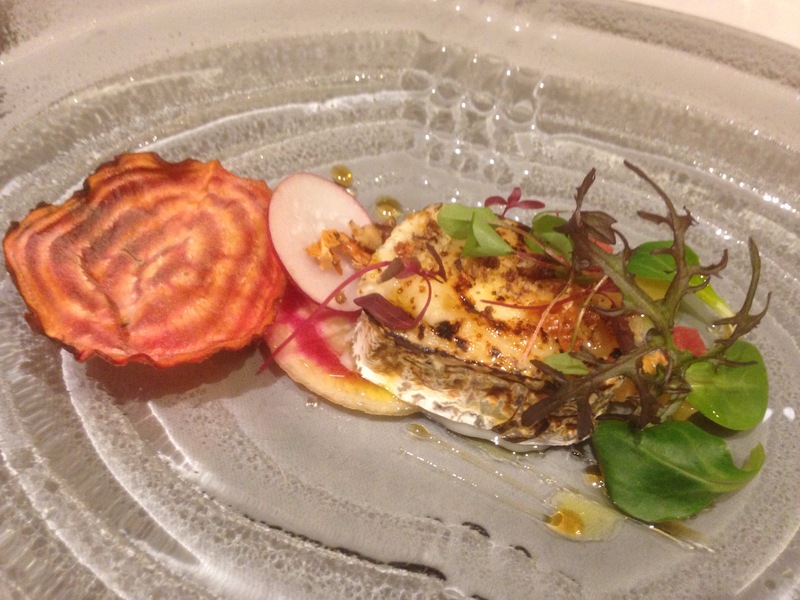 Over the years I’ve eaten some stunning dishes at Purnells. 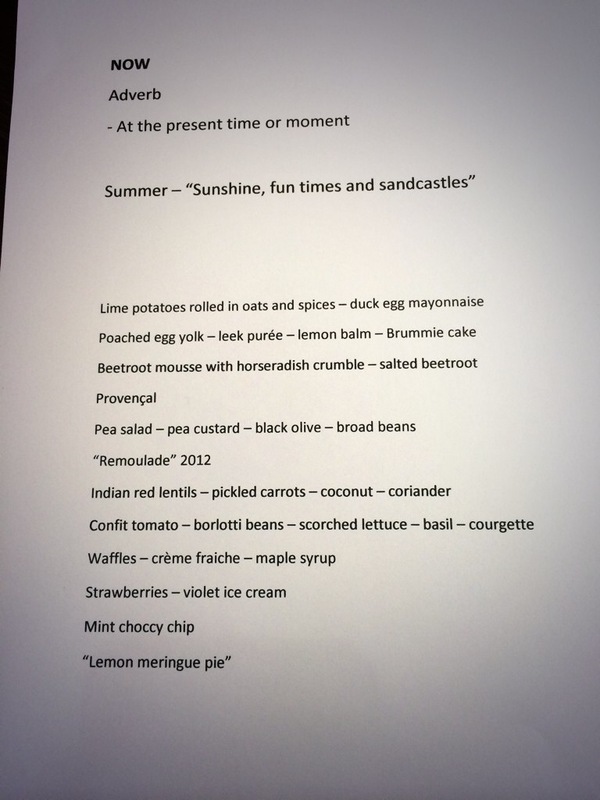 The ‘now’ vegetarian tasting menu is 12 courses long. 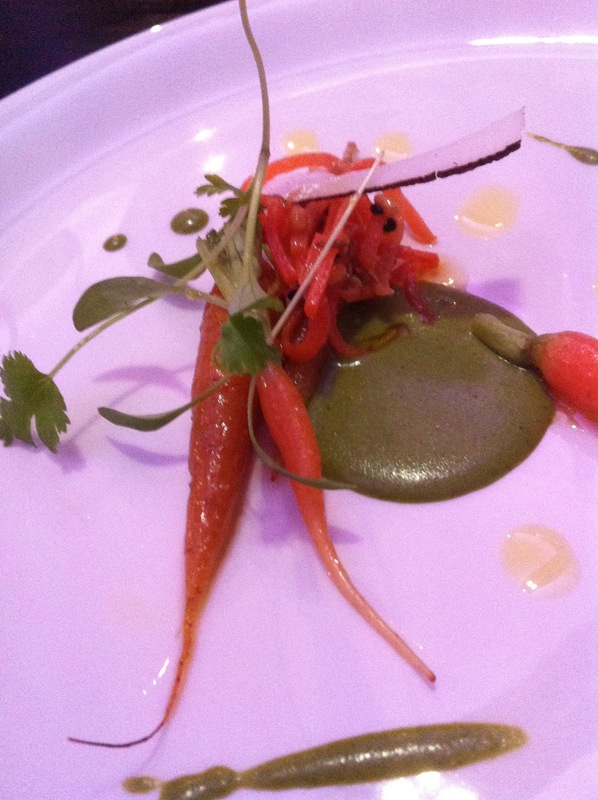 Each dish is a visual treat that is a feast for the eyes as well as the palate. 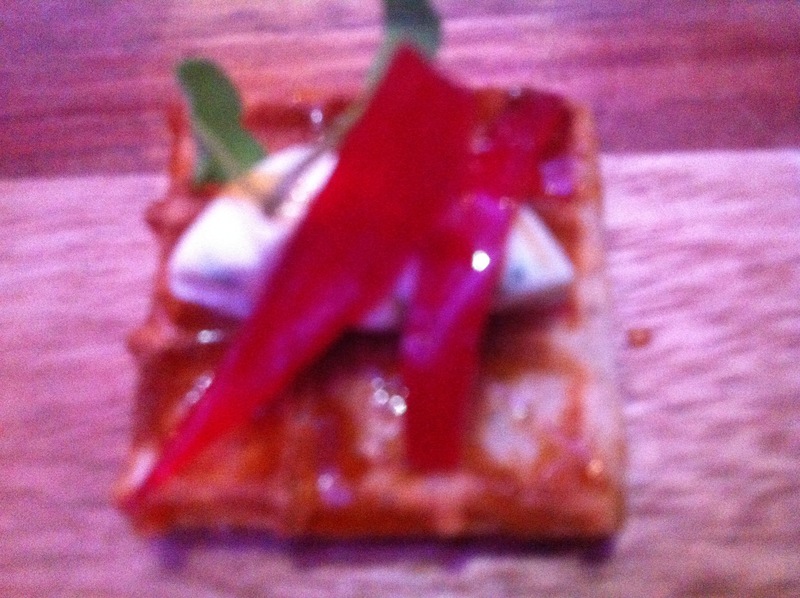 The imagination and skill across the menu was only bettered by the textures, flavours and playfulness of the menu. The dishes are listed in the photograph of the menu. I’m not going to go through each dish individually but mention my favourite dishes on the night. 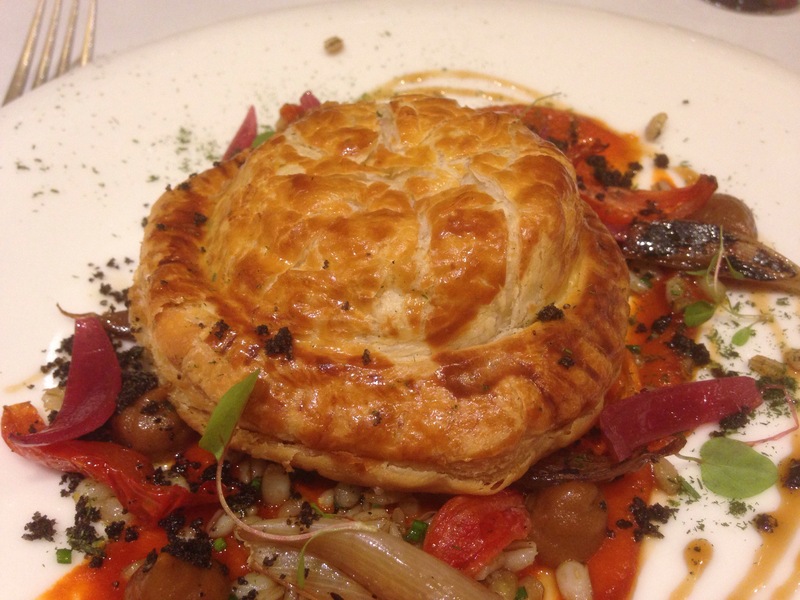 Your menu may be different, dependent on the season and your personal tastes. The vegetarian ‘Now’ menu is adapted from the non veggie ‘Now’ menu. The last two desert courses were the same on both menus. 1.Lime potatoes in oats and spices duck egg maionaise. 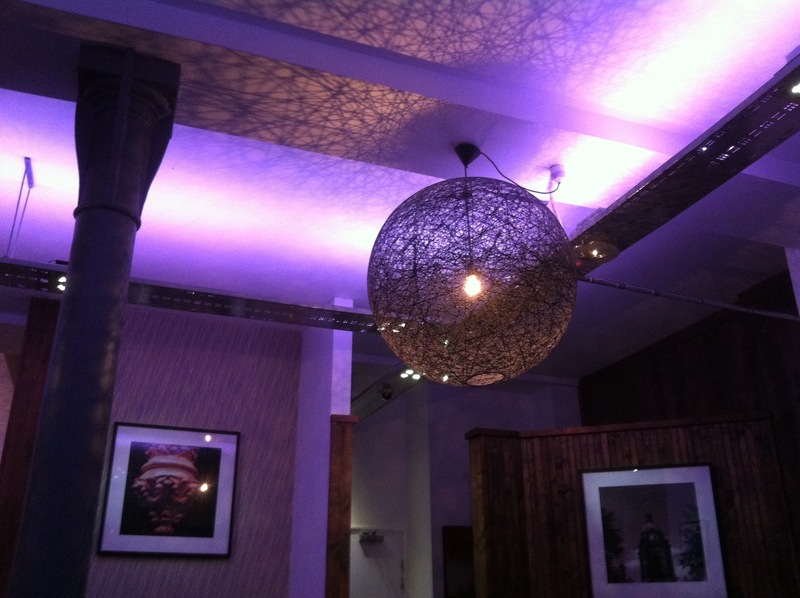 Photograph courtesy of the restaurant. 2. Poached egg yolk leek purée, lemon balm Brummie cake. Refined, delightful wonderfully presented it sets the scene with its eggy notes of flavour. 3. Thus the third course of Beetroot mouse with horseradish, salted beetroot was a fine dish, an ensemble of harmonious flavours and fresh beetroot which floated gentle notes of flavour over the horse radish. A lovely balanced and fresh dish. 4. Provencal morsel. A delicious interlude. Well executed. 5. 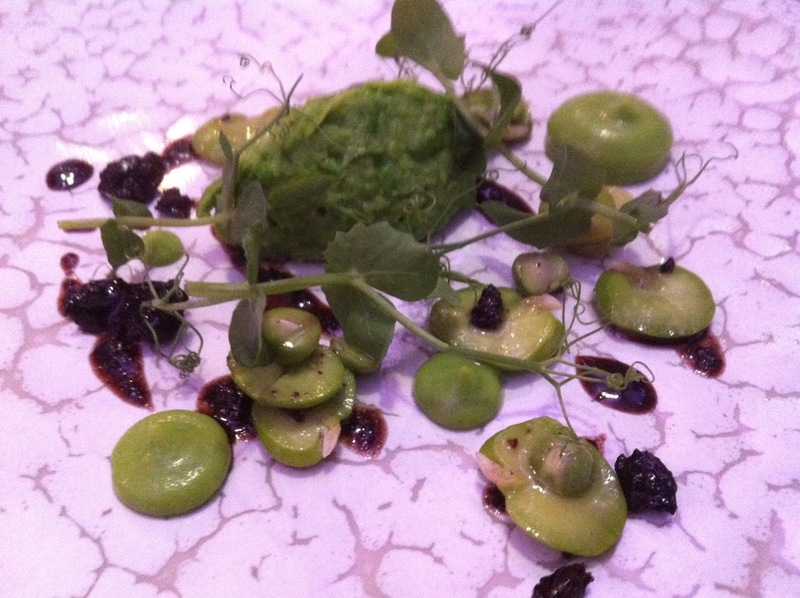 Next came The pea salad with its fresh flavour of peas, broad beans, that exalted the seasonality of the produce to create a wonderfully hypnotic dish. Fantastic. 6. Remoulade 2012: A palate cleanser, three morsels designed to be eaten in succession in order to increase the flavours of the first. Breathtaking cooking. 7. 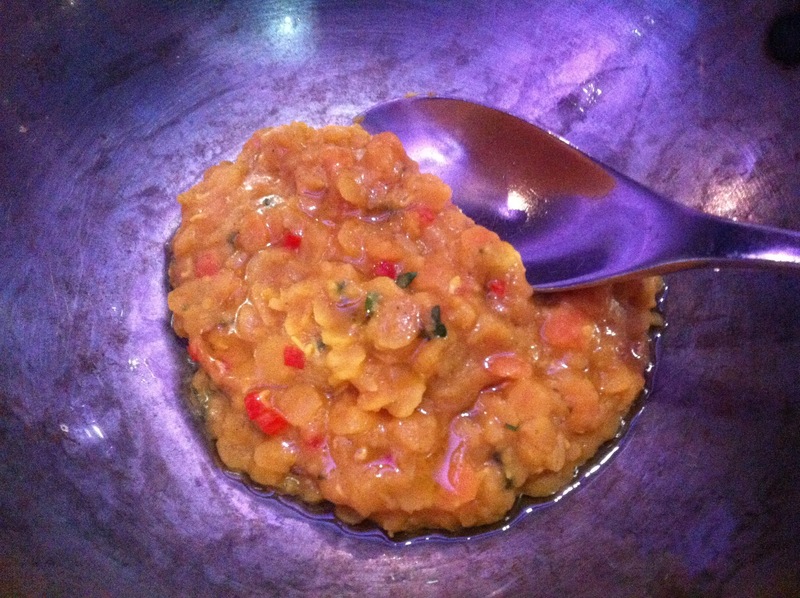 My favourite dish:) served along with the divine spicy lentils, which have an advanced spicy note that compliments the pickled carrots a harmony of stunning complicated flavours, with superb depth. 8. 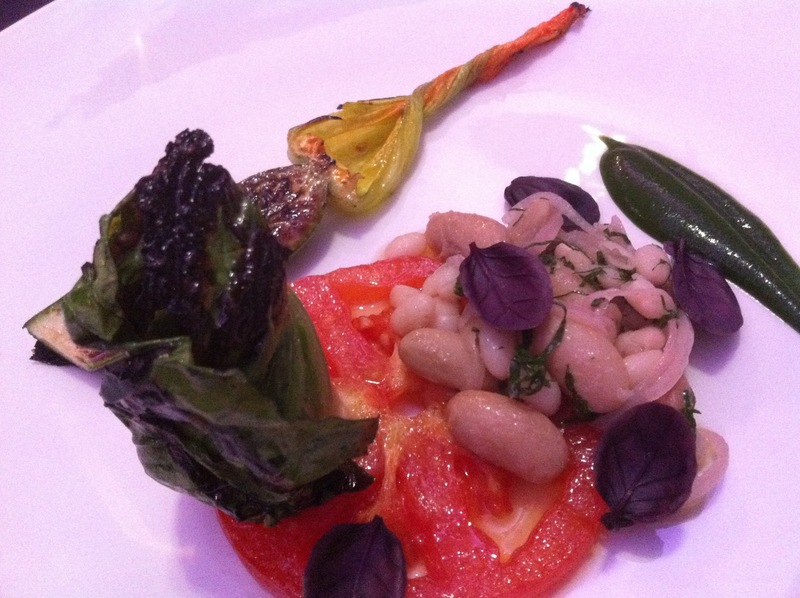 Main course: tomatoes bursting with flavour, Mediterranean like textures, with the gentle borlotti beans, contrasting with the scorched lettuce and courgette, lovely. 9. Waffle: morsel. Underwhelming dish because of the quality of before. 10. Deserts: Strawberries and violet ice cream. A delectable simple dish, summery and pretty. 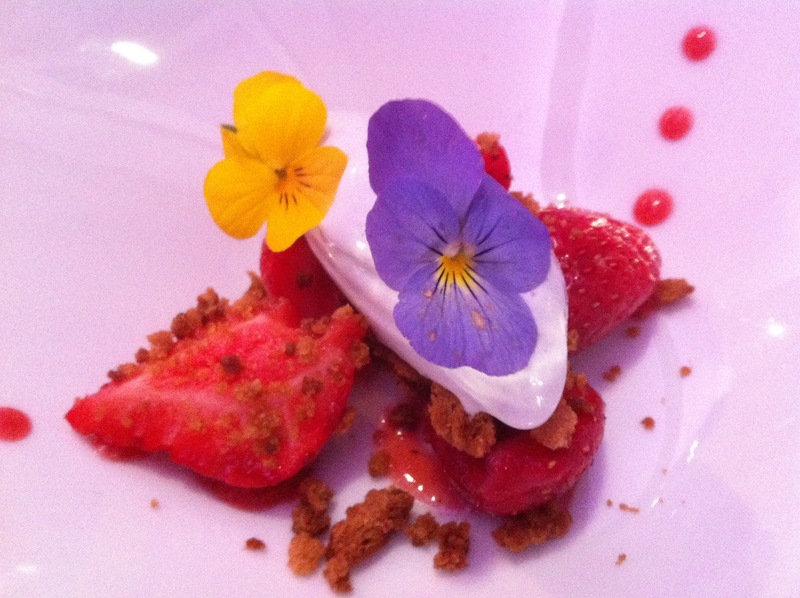 Lovely, a take on strawberries and cream. 11. Mint choc chip, a playful take on summer ice cream and chocolate. 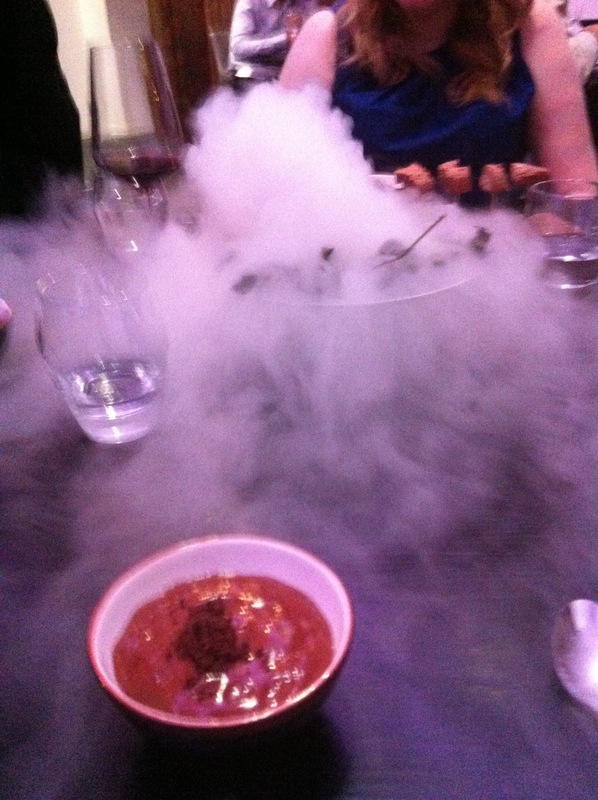 Pure theatre, with minty notes wafting off from the steam stimulated at the table. 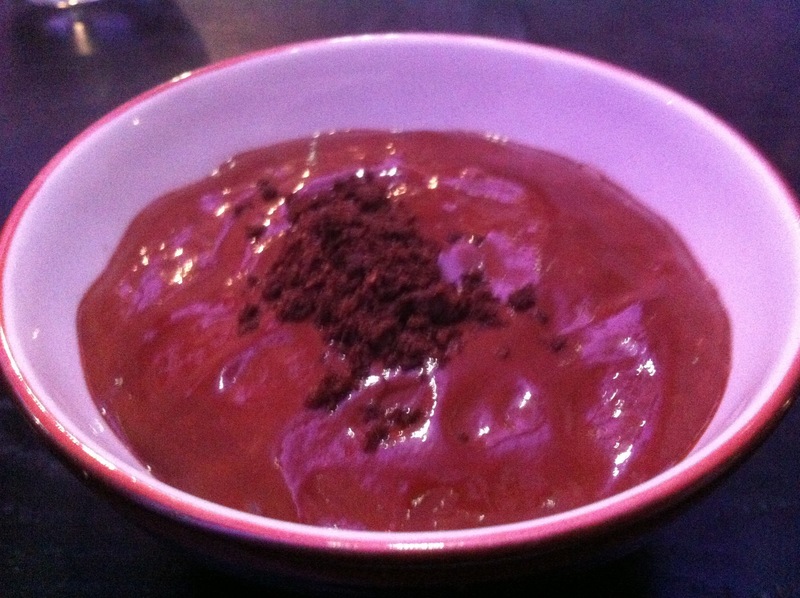 Rich chocolate, pure heaven for chocolate lovers, teasing the palate. A lovely desert. 12. 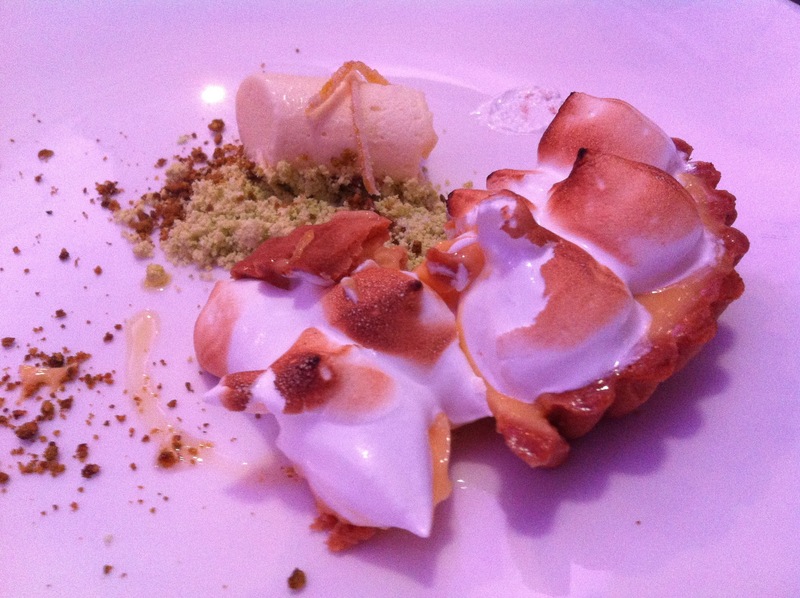 Lemon meringue pie: demonstrating Glynn Purnells, nostalgic playfulness. 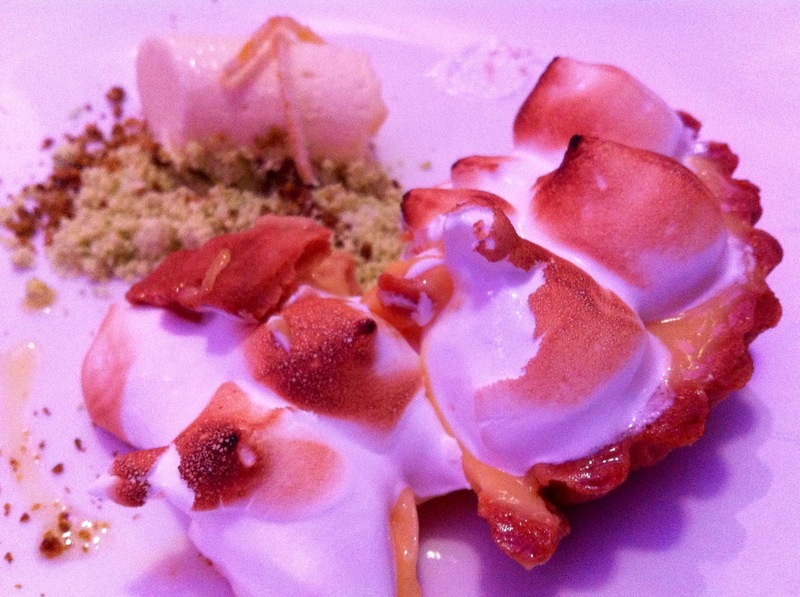 The best lemon meringue I’ve ever had. A truthful report of his culinary vision. Evocative of childhood, a refreshing desert. Purnells Deserts are playful, all fabulous, always original. The service throughout the meal was excellent, formal/informal with the right balance between interaction and restraint. The staff at Purnells represent the restaurant well with enthusiasm and knowledge. 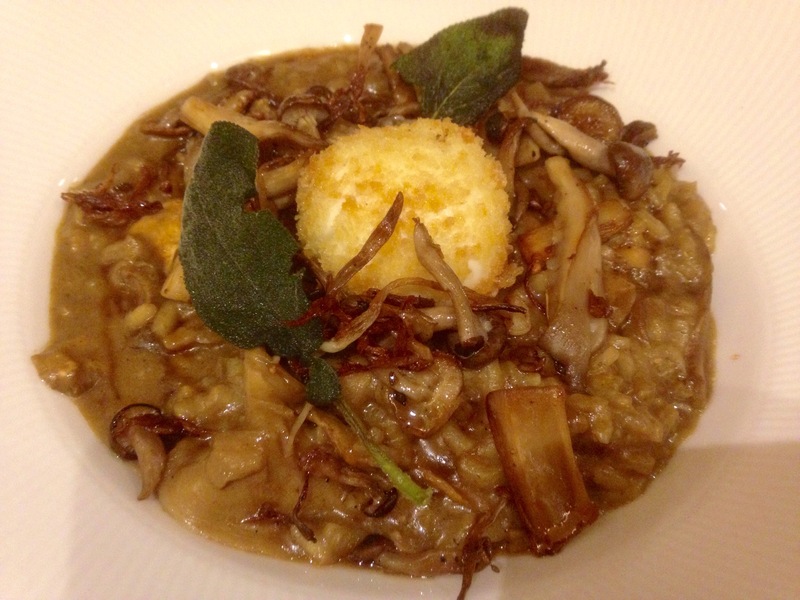 A vegetarian meal at Purnells is a cosseting experience. Glynn Purnells technical competence is evident. 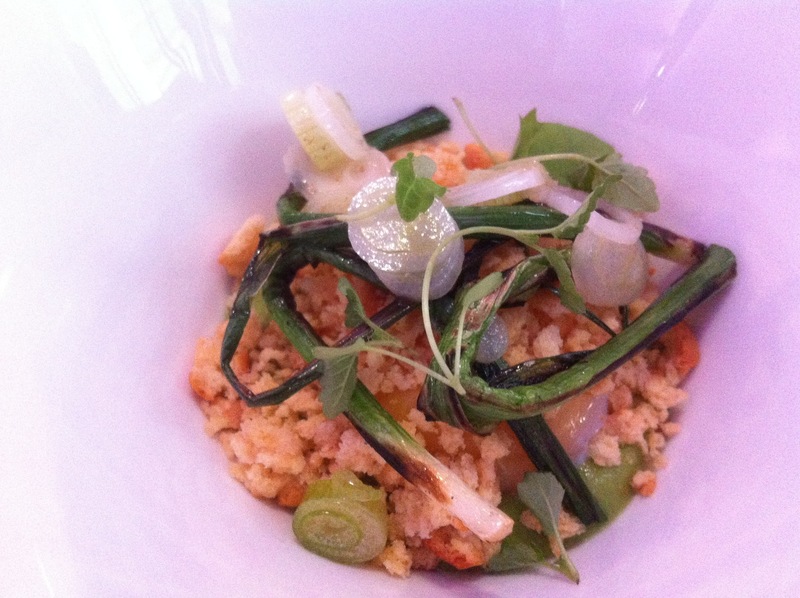 My food was incentive, seasonal, with superbly executed dishes that struck the right balance of flavour and texture. Delivering on all levels, of indulgence and nostalgic fun. Purnells shows a keen focus on sourcing on the ‘now’ menu, quality ingredients, evident in the freshness of the menu and the work put into the dishes to make them delightful to the palate. 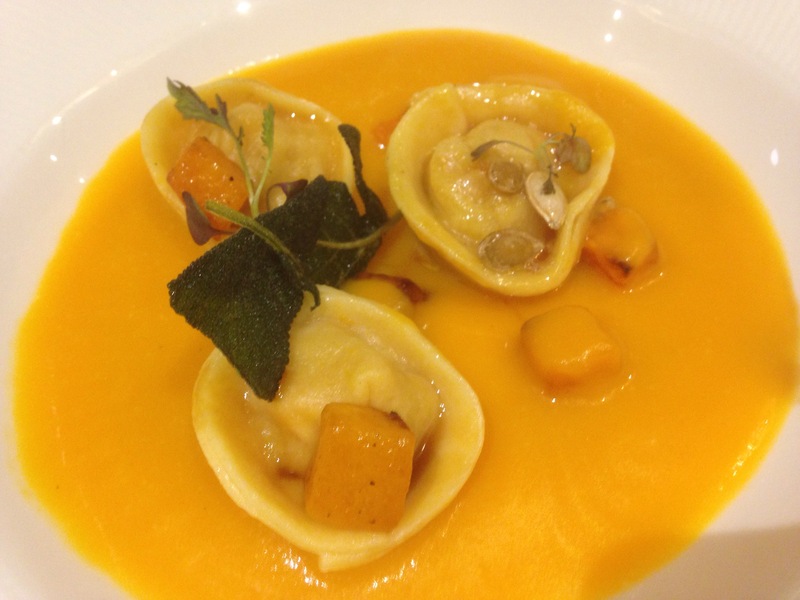 This star still shines brightly delivering stunning refined vegetarian cuisine. Every course delivers something new, always innovative and thoughtful. Please note, your dishes may not be the same as the ones I enjoyed. Due to seasonality and dietary preferences. Let then know your desires and enjoy. 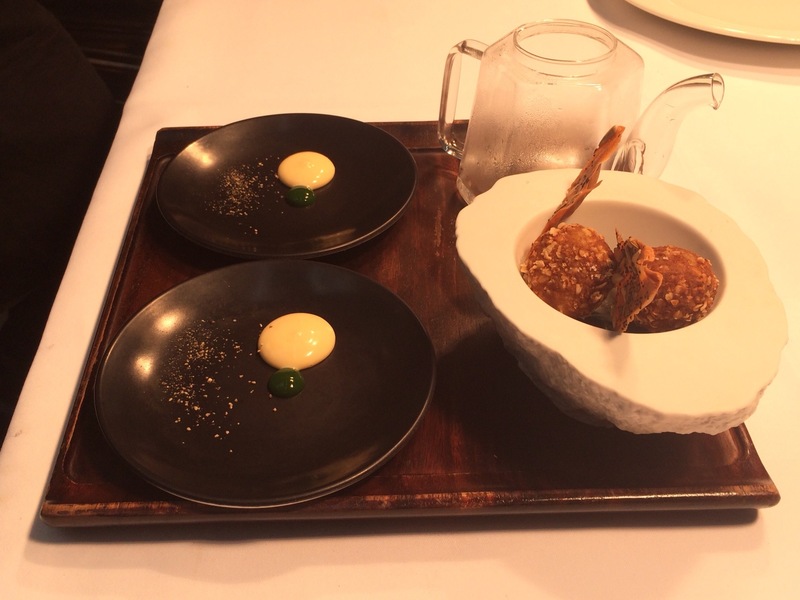 The cost of the vegetarian tasting menu is £85 per person. 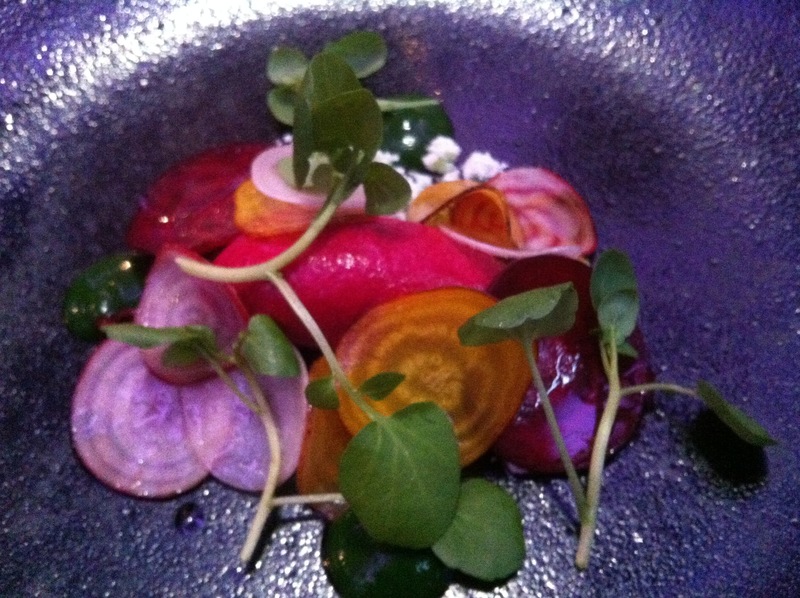 Ruth and our two friends had the ‘Now’ tasting menu (non Veggie) and said it was superb. 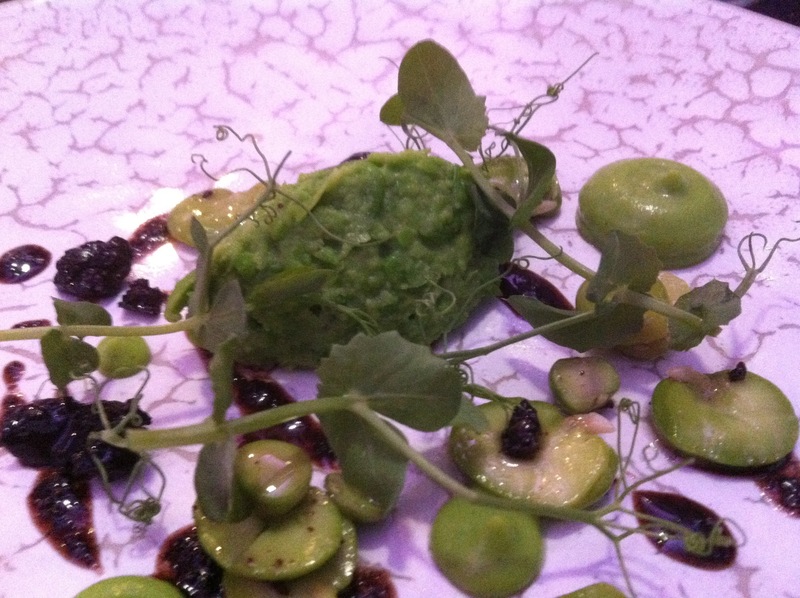 Has anyone else being to Purnells and had athe vegetarian tasting menu? What did you think? Disclaimer: we paid for our own meal at Purnells. The opinions expressed are my own and are honest and true. Reservations taken up to 90 days in advance.